Her sharp and eloquent essay entitled 'The Flawed Narrative on Yemen" is one of many articles she authored where she's been offering some of the great reads on Yemen's current affairs. "I'm the @womanfromYemen who just followed you on Twitter," that's how she introduced herself to me when we first met in 2011. Ever since she's been one of my intellectual heroes. 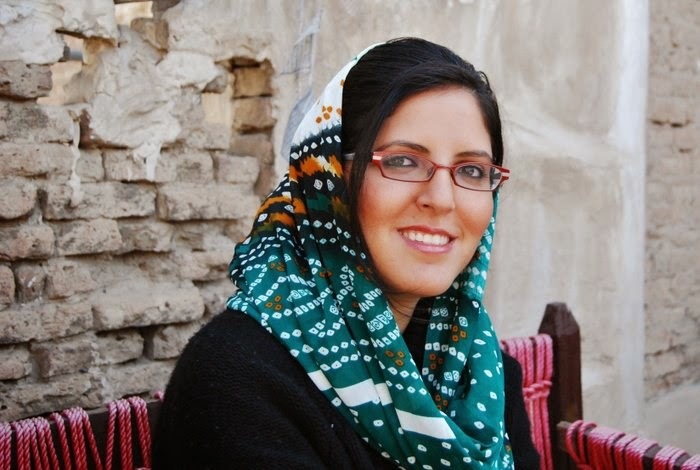 Atiaf Al Wazir is one of the most important voices from Yemen - she works as a researcher and consultant, and she frequently blogs at Woman From Yemen on a range of issues. A crucial issue about Yemen is how mediatizing its ongoing conflicts and the terrorist groups' work have been very problematic. Take the unfortunate killing of Luke Somers and Pierre Korkie! During that week, not only international media portiated Yemen as the land of terrorism, but even Yemen hashtag was trending on Twitter, associating the country with terrorism. Directly or indirectly, Yemen suffers from propagandistic media coverage, how journalists must deal with that? and how Yemenis can understand that? I turned to Atiaf Al Wazir for answers, few days ago. With the unfortunate killing of Luke Somers and Pierre Korkie, the world's media attention is once again on Yemen as the land of terrorism. How can Yemenis defend themselves against such miscategorzation? Firstly, I can't stress enough how horrible the attack on Luke and Pierre was. And I really admired how Luke worked his entire career trying to change this mainstream image of Yemen. Secondly, I think Yemenis shouldn’t feel the need to defend themselves. When kidnappings or killings happen, these actions are conducted by individuals, not by an entire population. They were NOT the ones who committed these heinous crimes. They were not involved in any of it. Yet, somehow many feel the need to apologize, because if they don’t then some abroad wrongly assume that they must be supporting such terrible actions. It is this bigoted assumption that needs to be changed. Do we assume that most Americans accept the death of innocent civilians just because sometimes drone strikes kill innocent children? Of course not! The assumption should be, that Yemeni like most people around the world, are human beings. They too, do not want to see blood spilled. This is especially true, since majority of people who have been targeted by militants in Yemen are the Yemenis themselves, so they know the impact first hand. This is often missing from reporting. If the same standards would apply on Yemenis as others around the world, we would see Yemen for what it is. We would see the loving families, the friendly strangers. We would see a group of people trying to survive, going to their job or their many jobs. A group of children playing in the streets, couples getting married and starting a new life. We would also see the difficult and gruesome realities as well. What happens now is that media selects only one aspect and calls that Yemen. Unfortunately however, when such incidents happen a blanket statement is made on all Yemenis. Then it is up to the people to try and fight against this stereotype, when in reality it should be the role of a dedicated and non-bigoted writer/journalist to show the country as it is. Not only from a narrow perspective. What can be the approximately more accurate main characteristic of Yemen? Like any country around the world, there isn’t just one main characteristic of it. A country is made up of people, and they always come from diverse areas, have different thoughts, and objectives. There is the reality of urban Yemen, then there’s the reality of rural Yemen. There’s the reality of the educated university professor, then there’s the reality of the garbage collector that has been stuck in a system of discrimination and poverty. The one reality or characteristic is that human being are human beings everywhere. To know the country, one must be with the people, understand their daily routines, their daily challenges and their future aspirations. From the "politics of representation", what elements must be taken into account when one is representing an aspect of Yemen in the media? As you can tell from my answers, I try to stay away from generalizations. Wherever you go in the world, you will find the kind, the evil, the rich, and the poor. So if you go with a preconceived notion of what Yemen looks like, you will get exactly what you are looking for, because that is the only thing your eyes see, and your ears hear. But if you go with an open mind, you will see Yemenis for who they are, human beings living day by day to survive. Unfortunately mainstream media act like parrots, mimicking what they have heard without looking internally at the country. Without understanding the nuances. They take what a very small minority has done or claims, and time and time again make that the predominant narrative on Yemen. If you read media today, you would think that the entire country has become filled with militants. This in my opinion is a clear example of bigotry, and of prejudice. We do not write the same way about other countries as we do about Yemen. In addition, this constant focus on militants is actually serving them by giving them free advertisment, and empowering them that way. They are seeking to be in the spotlight, and the mainstream media provides them that instead of highlighting the role of average Yemenis in their struggle against militants. We hardly hear about the various activities to combat militants whether it’s through protests against violence, poetry, re-education program, or economic opportunities. These activities are often missing from the dominant narrative.